Exhilarating. Heavenly. Pure happiness. Ecstatic. Unparalleled. Undescribable. Sheer joy. Falling in love with life. These are terms kitesurfers use when describing how it feels for them to kitesurf. For a newcomer considering getting started, these words may sound a little extreme. What does it really feel like to kitesurf? You feel the sheer excitement from controlling the great power of your kite, the adrenaline rush from sliding across the water, the thrill of weightlessness when flying in the air, the pure joy of being immersed in nature during hours. You feel privileged for these awesome moments, and you get addicted to the sport and lifestyle. While the overall feeling is that of excitement and happiness, you go through a lot of different feelings and mindsets as you learn to kitesurf and later build up mastery in the sport. In this post, I’ll describe the different states of mind I – and most kitesurfers – went through throughout this journey. 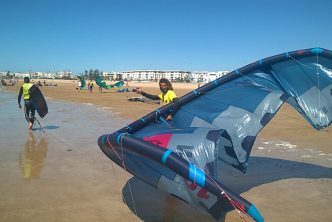 What does it feel to initially fly a power kite? As you’re standing on the beach learning to fly a kitesurf kite for the first time, usually with an instructor or an experienced friend, the first feeling you get is one of surprise and amazement as you realize the sheer power of the kite and how easily it can swipe you off your feet or drag you at high speed. Until you learn to launch your kite properly, depower it and bring it back into neutral, you also feel a bit of anxiety and fear, as you realize how bad things can go if you don’t know what you’re doing. Just look at how some learners go into panic as their kite gets out of control due to an incorrect maneuver. Despite the instructor’s repeatedly telling them to let go with the bar to depower the kite, they will often hang on to the bar helplessly, unable to think straight, actually powering up their kite even more. How does it feel to stand up and start riding? Probably one of the most memorable feelings you’ll have down the road will be from your first successful water start, when you dive your kite into the power zone, get pulled upright on your board, and start sliding in the water for the first time. The feeling of power from the traction in your harness, and of controlling this power, is simply amazing. Unfortunately, this awesome feeling is typically short-lived as, after getting up on your board, you will typically lose power and speed and sink back into the water. If you do things right the kite will go back up to neutral position, but many times you’ll have your bar tilted making the kite drop right down into the water. When this happens you’ll go back to the painful experience of helplessly drifting downwind in the water with your board floating away from you. In a few minutes you went from sheer joy to uncertainty, anxiety and sometimes discouragement as you’re not sure how to relaunch or how to get back onto the beach. How does it feel to kitesurf upwind? This is where the real thrill begins! You’ve been through the whole painful learning curve and spent countless hours walking back upwind on the beach with your kite pulling you hard. You’ve paid your dues. Then one day, bam! After riding away from the beach, you magically return to the same point you started from – or even higher upwind. The feeling of carving your board upwind is hard to describe, much more than a technical accomplishment, it’s the true feeling of kitesurfing. You can now lean into your harness, relying on the wind to keep you from falling backward. You’re no longer just standing upright, you’re hanging off your harness diagonally above the water. Once you’re comfortable holding the bar with one hand, you’re able to drag your other hand in the water and sense the water and speed. You feel one with your kite, your board, and the wind. Everything comes into alignment, the ultimate reward for all this hard learning work. You’re in the moment, not thinking about anything else, with a burning feeling of joy in your stomach. How does it feel to freeride kitesurfing? As you get more and more comfortable riding your kiteboard, you start counting the days to your next kitesurf session. By now you typically found a couple of buddies to go ride with you, so the excitement of kitesurfing combines with the pleasure of being with friends who share the same passion. 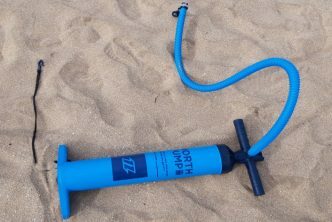 As soon as you get to the beach, you must find the patience to do the whole setup ritual – laying out the lines on the beach, inflating your kite, putting on wetsuit and harness, launching the kite with someone’s assistance etc – which seems to last an eternity each time. It actually takes newer kitesurfers a lot of time but becomes faster over time. As you finally get into the water and start riding again, you eager seek your fix of adrenaline and joy, this ultimate feeling of power and sliding across the water at high speed. Initially, you mainly focus on tempering your speed, being afraid of losing control and crashing hard onto the water (that hurts). But as you learn to edge completely upwind for lowering speed, your confidence grows exponentially, and all you want is ride faster and faster. As you speed across the bay, you can feel and see your board slashing the water like an inboard. You feel the pure power of the wind. After a while you no longer look at your kite to check its position, you start feeling it instinctively. When this happens you become much more free, free to look around you, feel the beauty of nature and the wind in your face, see birds flying around your kite, see the dunes in the backdrop. You seize the moment. This may sound a bit lyric but that’s exactly how I feel. Kitesurfing makes you feel alive. How does it feel to get air with your kite? A major aspect of how it feels to kitesurf is jumping. Initially, you do very small jumps just to feel how pulling on your bar can lift you and your board up. It typically seems like several feet in the air, but most of the time you only got a few inches off the water. Later as you improve your technique, you learn to really edge upwind and pop your board while throwing your kite hard into the power zone, thrusting you high into the air. This gives you a brand new feeling of weightlessness and flying. If you’ve ever, as a kid, dreamt of flying off a roof with an umbrella in your hands, this is now happening to you. As you go up in the air, gravity and noises fade away. While you carve on your board at high speed with your kite powered up, you get a lot of noise from the water splashing around and the strong wind in your ears. As soon as you take off, however, silence settles. Time stands still, and seconds feel like minutes or hours. As you fall back down from your jump, the excitation sometimes turns into anxiety as you hope for a soft landing – you know how a failed landing can send you to the hospital! How does it feel to ride a wave when kitesurfing? Another major adrenaline rush kitesurfing will give you is when riding waves. Before you can ride a wave you have to deal with the hardship of going over the waves as you ride out to sea, a tough skill to learn as a newer kitesurfer. Jumping waves isn’t easy, it’s board speed and angle, and having just the right amount of kite power at the right moment. The feeling you get from riding a wave will add to your adrenaline fix. The ultimate goal is to get in a position where you depower your kite and surf the face of the wave with minimum pull. Doing this can give you an immense feeling of awe and freedom. Many times, however, you end up getting too much slack in your lines with your kite dropping into the waves, leading to potentially disastrous consequences. As always with kitesurfing, you can very quickly go from a feeling of pure heaven to hell. Wave riding is a highly exciting yet technically challenging skill that you’ll pick up with lots of practice. Once you do, though, the feeling of freedom and unity with nature is unequaled. Describing how it feels to kitesurf is difficult, yet by observing and talking to kitesurfers you can probably get an intuition for how great they feel. Kitesurfing gives you a feeling of amazement for the power of wind and the ability to control that power and generate great speed. Some even say kitesurfing is a meditative experience because when you kitesurf, there’s no other place you’d rather be, and you usually forget about everything else, focusing on your kite, your body position, and your board. The rush of kitesurfing comes from the power, the speed, the loss of gravity when flying, the ocean and nature that surrounds you. Few other sports combine these elements the way kitesurfing does. For these reasons, kitesurfing is extremely addictive.